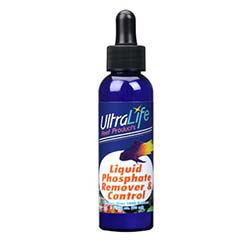 Home > Popular Category > Aquarium Water Additives > specialty-supplements > Ultralife Reef Liquid Phosphate Remover & Control 2oz. safely and effectively removes phosphate (P04) from your aquarium. Simply add .25 ml for each 8 gallons of aquarium water to remove 1 ppm. It is recommended not to remove more than 1 ppm in a 24 hour period. To avoid tank cloudiness, add to a skimmer or mechanical filter intake.